You know how I love classics of all kinds. I am drawn to what has long been valued and loved, and furniture is no exception. Amidst all the trends that come and go stands the romantic, timeless furniture sold at Magnolia Hall. It is reminiscent of the past but looks just as beautiful in your home today. The company opened in 1962, and when the doors were going to close years later, longtime employees and husband and wife Barry and Becky Nerli decided to take on the challenge of running the beloved business. They now proudly have a staff of four, which allows the experience of buying from Magnolia Hall to be personal and enjoyable. They sell almost everything you can imagine, from curios to chaises to consoles and clocks. But when browsing through their impressive and lovely offerings, a few items especially caught my eye. First, I noticed their vintage vinyl flooring, which I think is a fabulous idea for adding sleek, durable, vintage charm to any room. They come in a variety of colors and patterns and sizes, and they’re a simple way to make a big impact. As you know, I am one of the most emotionally charged fans of Downton Abbey in the world. I am sure you have already heard that the upcoming sixth season will be the last—more later on how I plan to cope. When I saw that Magnolia Hall sells a line of Downton Abbey– inspired lamps I was just thrilled. Can we ever get enough of those beautiful scenes in Highclere Castle? I love the elegance of the rooms and the lovely way the accessories add to the beauty, and these lamps capture that style that I love. Magnolia Hall has graciously decided to offer a giveaway of the Fringe Table Lamp, inspired by the décor of Downton Abbey. It has floral flourishes, a hand-painted base, and fringe and tassels—I’m sure you’ll just love it. Do you have a treasured piece of furniture? It makes my heart happyto just look at the lamp. This would be amazing to win! What a lovely piece! Thank you so much for the chance to win such a beauty…. Shared on my Facebook page June 23, and eagerly awaiting announcement of winner! The lamp is beautiful–any fan of Downton Abbey would love it. I am excited to veiw your business’ ideas and inventory. Will send this email to friends but don’t do the social media well. What a beautiful lamp and I have the perfect spot to display it. My parents began tracking down family heirlooms when I was in high school. I developed an appreciation for antiques that has grown stronger with age. When my mother came to live with me so did the family pieces she restored. She is no longer with me but her room is still a place I go for solace and she would have loved this lamp. I’m a Downton Abbey fan and recently went through the Dressing Downton Abbey exhibit at the Biltmore with friends. We even played the Downton theme on our CD as we entered the grounds. Can you tell we are fans? Yes, I’d love to have the lamp. I relocated nearly a year ago and I have an empty spot on a table just waiting for it:) Thanks!! I know exactly where I would place this lamp! I’ve been a fan of antiques and accessories from the Victorian Era for as long as I can remember – especially accent pieces that lend an air of whimsy and beauty. How kind of Magnolia Hall & The Ribbon in My Journal for offering such a lovely giveaway! Thank you so much! Hello! What a fabulous lamp! My husband and I just finished season four of Downton Abbey. We are complete fans! Starting season five this weekend. I am sadly the whole servant crew for my family and household. I have to remind myself to stop and get out away from total servitude for a day. I would love to own this beautiful lamp!! I would love to have this beautiful lamp, to enjoy its warm glow on a cool rainy day. Would love to have this lamp! Gorgeous! I love the era of Downton Abby! This lamp would look great on my dresser bringing warmth, coziness, and light! I’ve just finished decorating my dressing room and I think the lamp would look so pretty in this new room. The floral colors and the background tones are just beautiful and would enhance the decorating job I have already done. Please pick me. I’m a big fan of Downton Abbey too! would love this lamp for my bedroom. It would go on my grandmother’s maple sewing cabinet which I am using for a bedside table. That would make two treasured pieces of furniture! I would love to win the lamp for my study. I have always loved Magnolia Hall’s furnishings. My sister-in-law just visited Highclere Castle in May; a very special trip for her, a lover of all things from this era. My brother passed away last year and I know she would treasure this lamp for many reasons. I have the honor of safe-keeping a corner cupboard made in the 1600’s that belonged to my husband’s family. It will be passed on to my children. I would love to have that lamp on my art studio desk. The lines of the lamp are so graceful! I pinned the image to my “decor” board. The Magnolia Hall store has so many lovely things. 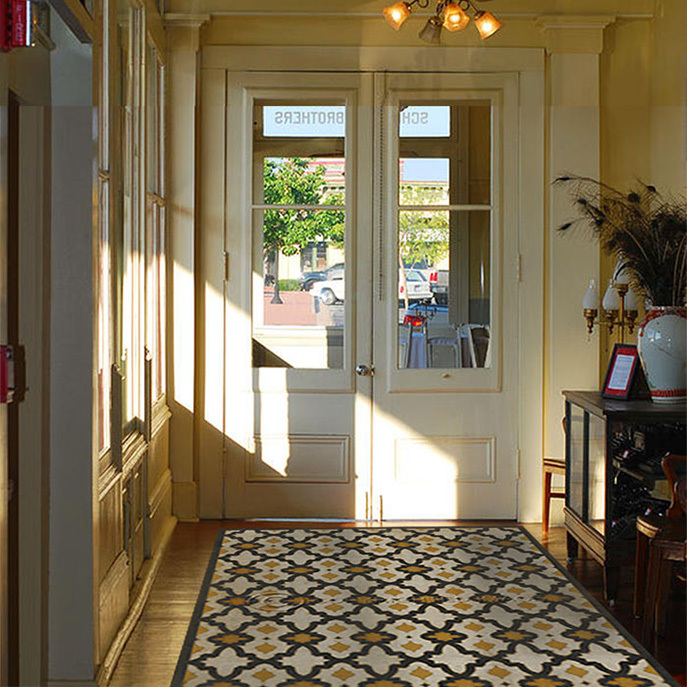 I especially like the vinyl floor coverings…perfect at door ways over the hardwood floors in our new home. I’ve pinned several of the floor coverings to “decor,” as well. Count me as another fan of Downton Abbey! My most treasured piece of furniture is the small chest of drawers my mother bought to hold my baby clothes before I was born in 1943. The lamp is beautiful. When I moved from my house to a R.V. I had to give up most everything, what a delight it would be to have this adorable lamp in the R.V. Wish everyone luck. I am addicted to DA. I have the first five seasons on DVD and watch them while I sew. My home was built in 1922, so I adore the furnishings and costumes and would love to own s lamp like that. I have DA fabric to make a double wedding ring quilt….someday soon, I hope! Downtown Abby ,What a marvelous show. Beautiful setting and Lovely place.Right down to the clever and humorous cooks and housekeeping.This Lamp is so exquisite,and Unique beautiful.The shade is simply gorgeous.I would love to win a bit of Downtown Abby style in my home! Roses are timeless! A truly classic addition to almost any home. Downton Abbey has been a real treasure. I live the months until the new series is shown counting the days. It has been a major point of sharing for me and my friends from sixteen to sixty. If I win, I’l give the lamp to my sixteen year-old friend who loves the Downton Abbey as much as I do! My favorite piece of furniture is my china cabinet. It was purchased by my grandmother, passed on to my mother, now it’s home is in my kitchen. I am honored to continue its tradition in our family! What a lovely lamp! It reminds me of the elegant lamp that sat on a beautiful antique table in my adopted grandparents home. It would be a pleasure to own such a beautiful lamp. I so enjoy Downton Abbey and wish that the manners, customs, and refinements were still present today. I was lucky enough to have seen the costumes of Downton Abbey at Winterthur this past fall. They were just amazing. One of my friends even bought a hat from the costume collection. It would be an honor and a priviledge to own something that beautiful in my home. Thank you for offering this wonderful drawing. Both my hubby and I are die-hard Downton fans! What a gorgeous lamp to give away! I have missed the Downton teas held in SoCal, but hoping some more will pop up! I live in 150 year old house~so this would be a lovely addition to my antiques. This beautiful lamp would fit into almost every room in my home! Love, love, love this look! I just love this lamp! Sharing on Fb! I love this show! It takes us back in time and gives us a glimpse of the past. I get so relaxed with my popcorn and this show..just love it!! you for your lovely blogs. This is such a pretty lamp! Thanks for the chance to win! A charming lamp! It would add character to any home! What a lovely lamp. How will we cope when the final season ends? What a show!!!!!!! I love it. Shared on pinterest https://www.pinterest.com/pin/391602130076687870/. What a charming table lamp with such character! I watched season one this year not sure how I missed he show and became addicted. Watched the remaining five seasons in about a week. I love the show – the characters are wonderful and the location wow. The lamp would be perfect in my office/ craft room. I eagerly await Season Six of Downton ! After completion , I will begin again with Season One ! and if you win the lamp , Downton will forever grace your home ! Early congrats to the lucky winner. To answer your question – I have a “drum table” that belonged to my Grandmother . The table has been in my home for many years and has served our family well in various rooms – dining room, living and family rooms,hallways and bedrooms . It is probably 100 years old .It is priceless to me because of the sentimental value . A true family heirloom ! Thank you for another great post . You provide my dessert for the day! I hadn’t heard for certain that this next season would be the last. My heart is breaking. I adore the style and elegance of the furniture, clothes, and manners in the show. I think I need this lamp to help me get over my heartache. My, this is such a beautiful lamp, and I adore the Victorian period.This lamp style and the colors are perfect for all the pink and maroons in my home. Oh , to win this would be a true delight! This lamp is perfect for my redo of my deb into an English gentleman’s library. 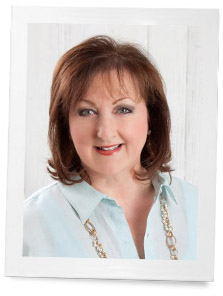 After living 29 years in Nashville, Tennessee, and falling in love with antebellum homes, antique furniture, lamps, and accessories, I moved to the Phoenix, Arizona area where much of the decorating is cowboy, southwest, Mexican, and native American. And the popular colors in this area seem to be tan, yellow, orange, and red. I get very hungry to stroll through a southern flea market or antique mall, or visit an annual historical homes show. And of course, one of my favorite television shows is Downton Abbey. I have been on Magnolia Hall’s mailing list for over 20 years, and upon receiving each catalog, I pour myself a cup of tea and devour every page of the beautiful furniture, lamps and accessories. The lamp you featured in today’s blog took my breath away! How do you think it would look in my southwest stucco home with Spanish tile roof? Perhaps it would fit with my fiesta ware better than I think – especially if I spruce up the table with my Mexican blanket and desert wild flowers! I have my great grandfather’s drop leaf table. I am 71, so it has been around for a long time. This lamp and Mr. Enoch Pugh Dill’s table would really be beautiful together. It’s a good thing we have several months to develop our coping skills! This beautiful lamp would add sew much charm and inspiration to my lil’ sewing room here in the Blue Ridge Mountains of Virginia. Thanks for the chance. What a great gift to win,it is so charming. Our tea club has visited England four times. Unfortunately, we were not able to include Highclere Castle in the itinerary. I would love to have this lamp in my home to remind me of the wonderful show. I too will be in mourning when the show ends this year. What will we do without sharing in the drama of the family and the staff?!? Count me in. So pretty…Who wouldn’t want it? I’d love to win, so count me in!! Sharing on FB, too! ~ Donna E.
I love to watch Downton Abbey and the lamp is lovely. Wow….beautiful lamp! I’m terribly upset that Downton Abby is coming to an end. Also hoping they create a spinoff….of course it will not be the same! I am so sad that next season will be Downton’s last, but I am ever hopeful that a spin-off might ensue! Julian Fellowes is great. As a collector of antiques and period pieces, myself, I would be happy to win this lamp! It would great in any one of three rooms in my home, such as my great room, my office of my den, otherwise known as the “Titanic Room”, as it is thus themed! Thanks for the opportunity! I love this lamp! 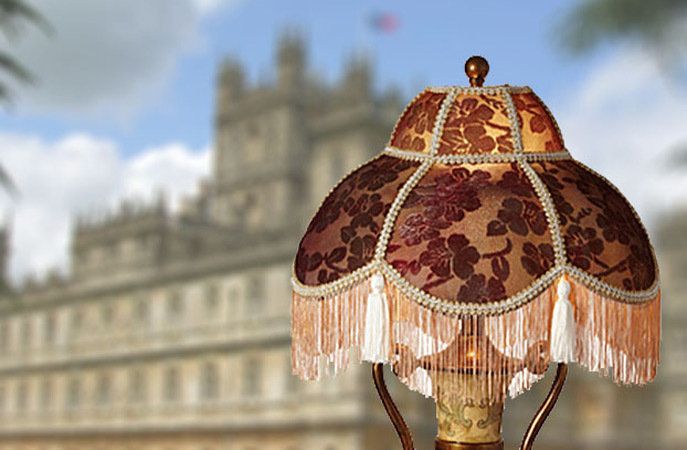 What treasure it would be to have a Downton Abbey lamp! To say that I am an avid fan of Downtown Abbey is a true understatement. My husband bought me the first season and from then on I was totally taken by it. I cherish my British heritage (I was born in Bristol, my Dad was serving in the Army during World War II, and I came here with my war-bride Mum on the Queen Mary). My home is a true reflection of my British heritage and the addition of this lamp would be amazing. Thank you for giving me the opportunity of winning it. I have a 1950’s Haywood Wakefield end table. I fouund it a resale shop. Reminds me of a beloved aunt.. I love beautiful and elegant items and especially ones that have been loved and cherished. Surrey with the fringe….on the bottom….Lovely lamp….great giveaway! I love Downton Abbey! The change of pace from modern life is so refreshing. If I won this lamp, it would be a constant reminder of life in days gone by….a true inspiration. My daughter Marlena is a huge fan of Downtown Abbey. She will be moving out on her own soon and I know she would love this lamp and treasure it in her new home. Like you she is having a hard time coming to terms that this will be the last season of her favorite show of all times. Maybe you two can get together and figure out a way to cope with this together. I have a very special “elephant” table given to us by my father in law. He brought this back from Africa along with an end table. Both are of rich mahogany. They were acquired when he was a Capt in the Merchant Marine. I love everything that is vintage and have clocks, mirrors and a lot of antiques given to me by my mother in law. She had a very old home in MA and left some antiques to my husband. We have a great home here in FL and have been renovating it for the past ten years. We named our home “Camellia Cottage” as it has 21 Camellia Bushes in the front and back yard. I hope I win the lamp as it would look lovely in our home. Reading the European Homes & Style on my lunch break today. I love the History at Heart and Swedish Touch homes. My home would appreciate the Downtown Abbey lamp- Mrs. Mary would approve. I’d like to have it because it’s beautiful. Downton Abbey is my favorite program to follow. It is so easy to get caught up in the lives of all the characters..even the ones you don’t always like so much!! I would love to win the lamp, not only because it would match my living room décor, but because it would ensure that I would remember my favorite program and also a wonderful magazine each time I looked at it! Love this lamp. Would use in my bedroom, but could use in any room. I put on Pinterest so everyone could see and be inspired. Shared on Twitter (https://twitter.com/Brittles526/status/613391392576942084). I would love to win because it’s very pretty and I really need a new lamp in my bedroom. This is a beautiful lamp, I tweeted https://twitter.com/sandz4321/status/613390625329803264. Thanks for the giveaway. I think my mother would really like this. My most treasured pieces of furniture did not come from a store but my grandfather’s workshop. It was a hobby for him and although he never had any formal training in the field, his pieces have withstood the test of time and hopefully will continue to be treasured by the next generation. The lamp is lovely ,Phyllis. What a lovely reminder of a lovely television series. I too will miss it terribly. I adore vintage lamps they are both elegant and homey. they fulfill something deep inside my soul. I love Vintage things. I love how genuine and true they are and I love knowing that there is a story behind it all. I can picture this lamp in my house and I can imagine all of the stories we’ll share, the books we’ll read, the tea we’ll drink, the episodes of Dowton Abbey we’ll watch. It sounds so beautiful to think about. I’d love that lamp and I’d love to give it a story. 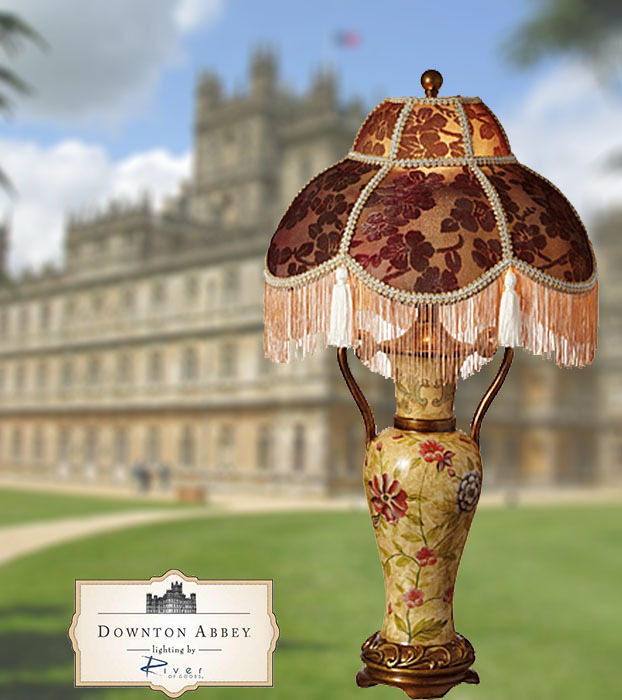 I would love to win this lamp for my husband’s 60th.birthday.He loves Downton Abbey! !We have every season on dvd,we rewatch them all the time,and we were very disappointed that this next season will be their last.It would be fun and very joyful to watch him open it up!I know he would treasure it for years and would leave it to one of our sons or grandchild.I get excited just thinking what a joy it would be to win it for him.He would tell everyone we know that he has a “Downton Abbey” lamp!!! It would be a huge blessing.Thanks for the chance to win this very beautiful lamp. It would be just wonderful to have a Downton Abbey lamp!! I have loved the show since the beginning and have purchased all the DVDs. As a matter of fact, I don’t watch the show on t.v., I wait until I can purchase the DVD sets; then my husband and I sit down to watch and enjoy as many episodes as we want. I am so saddened to see that season six will be their last. One of our sons and his family live in England so get to view it before we do, but they keep it to themselves so as not to spoil it for us. Well, I guess I shall just have to keep my fingers crossed and hope, hope, hope!! Please, please, please! I would love to own this lamp. It’s a beauty! Planning a Tea for my 70th Birthday to honor all the women who have helped me through life. Wouldn’t this be a lovely addition to the festivities and then as a permanent fixture in our “Victory (Victorian/Country) home? Each day is a treasure, so make the most of them. Just love the look of this lamp and it would be beautiful in my bedroom. Shared on Facebook. reminds me of one my grandmother and then my mother had… it didnt make it to me though! met a tragic fate…i cried.. would look so lovely in my living room window…..and bring me good memories…….. I love all things Victorian. This Lamp would be the crowing glory in my home. I would love a chance to win this beautiful lamp – I have the perfect spot for it. Have an empty space that this lamp would be the perfect accent for! I love all things Downton and would have a perfect place for this lamp. I can honestly say I have never watched Downton Abby. BUT, I am in the process of redoing my bedroom in furnishings from that period. I have not even thought of a lamp at this point but that lamp would fit in beautifully. I hear great things said about that program. Hopefully it can be bought on discs and I can watch it myself one day. I will shortly be moving to a new house and can picture this lamp in a particular spot. It will make a very elegant focal point in any room. Of course, I am a great fan of Downton Abbey and look forward to 2016 when the new series will be aired. All good things do come to an end so we must be thankful that Julian Fellows created such a wonderful saga. Thank you for the delightful publications we enjoy each month. This is an absolutely ‘me’ lamp. I am a very Victorian lady and love all things vintage and antique. My home is decorated likewise. I am also a big fan. To win this lamp will be a great honour. Thank you. I have laughed, cried, and deeply sighed at the never-ending drama within the walls of Downton Abbey. Now, to have a chance to win a lamp that could grace a room in the much-beloved series is incredible. I will keep toes and fingers crossed that I am chosen to give that lamp a new home here in Pa.
she said the hours we spent together as she told me about her life were ones that truly made her day. She made formal teas for us to share and she allowed me to touch and explore, As the years went by and my family moved from that West Texas home to central Texas ending up in Dallas, I was away in university. Mother kept the lamp, but when my parents moved back to Colorado for their retirement years,the shade became quite destroyed. Mother put the lamp in her basement. One day my aunt saw it and asked if she and her husband could get a new lampshade and use it in their bedroom. Over the years I lost touch with it. However, when I visited my aunt after the deaths of my parents,I stayed in the room and rediscovered it. I told my aunt the story and she told me she would give it to me in her will. My auntie lived to be almost 101! She never forgot and her daughter had it shipped to me in Vermont. My son bought a shade for it. I had it rewired and use it in my wee “Suuggery) by my reading and sewing chair. He knows a woman in New York whose makes such shades, and we shall pursue to do so. There was just such a lamp in Downton Abby’s sitting room! I call it “The Roulson” after my dear friend. I smile each day as I turn it on to light my day! I would love to have this Downtown Abby Lamp. The series has been a favorite of mine. This lamp would look great in my little Victorian cottage. My 89 mother would love to own this lamp. She is a huge fan of the show. She has all the books and has often pointed out the lamp shades with their fringe. She has a catalog from the sponsor of this giveaway. This lamp would be perfect for 90th birthday in October! Thank you for the giveaway. I’m a big Downton Abbey fan and would love to add this lamp to my home. I come from a long line of antique collectors, so appreciate this style. I too am an over the top fan of Downton Abbey and not sure at all how to cope with this last season coming up! This lamp is just BEAUTIFUL and reflects all of the elegance of this time period! Not to mention it would look SMASHING in MY very own living room!!!! Will share this on FB once I get home this evening! What a beautiful lamp! We have a lovely Victorian mansion in our community, a former governor’s home, which is open to the public. If I were fortunate enough to win this treasure, I would donate it to the museum for all to enjoy. I am just devastated that Downton Abbey will not going on past the 6th season. I just love that Era. Would love to have this beautiful lamp to remind me of the that Era gone by. My daughter-in-law is a huge Downtown Abbey fan. The lamp would be beautiful in her living room. So beautiful! I’m redecorating my guest room in all pink and beige! This would make the perfect statement lamp to decorate my room around! I have always loved the Victorian era in both home decor and clothing styles! Being able to have such a beautiful lamp grace my room, would be a constant reminder of how our past generations have influenced today. It is something to be thankful for. What a beautiful and unusual lamp! I am always on the lookout for another lamp – one of the things I collect! I would be honoured to be the winner of your giveaway – thank you for the opportunity! How pretty! I need your coping post. I cannot even go there right now. I’m living in denial. What ever will we do? The lamp is simply stunning. I would love to have it in my sewing room so I can hand quilt using the light. Thank you so much for the chance. It is absolutely beautiful and let’s me dream of a time that I can only read about. What a pretty lamp. It would fit perfectly in my bedroom. Thanks so much for the opportunity to win. What a beautiful style lamp. I can imagine the glow and ambiance…..hmm…in our bedroom. This lamp is simply lovely and I would love to have it in my home. Oh how I would love to win this Lamp.-I adore things from Magnolia Hall– Love Downtown Abbey style- and of course Victoria magazine since it’s inception.– Really is a perfect lamp style that fits my decorating style!! – Thanks for such a fun drawing!! I would love this lamp! It would go well in my house, i collect antiques. I am a huge fan of Downton and am so sad it’s ending! This would be a perfect reminder of this special show. It is a beautiful lamp! It would remind me of the antiques in my gramma’ house and also all the evenings spent with my dear husband watching Downton Abbey! Oh my!!! What a lovely lamp!! My husband and I collected antique lighting for years before his passing. I haven’t added to our collection since. This would look just beautiful in my ‘old house’…!!! I’ll keep my fingers crossed! Thanks for the opportunity…it is just BEAUTIFUL…!!! A lovely romantic look. I always look forward to receiving the Victoria Magazine and especially the August issue. This is classy and has a perfect touch of old world charm! I am such a fan of Downtown Abbey and to have an item that has been inspired from the show to have after the series is over would be so exciting!